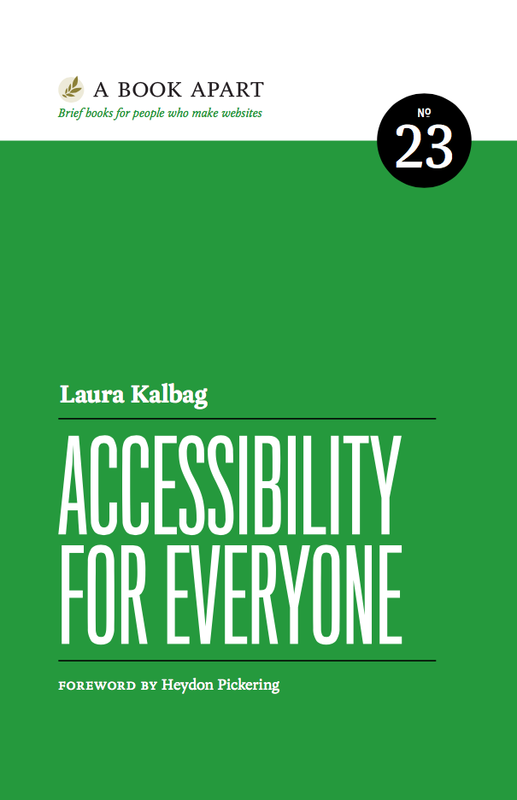 As I mentioned yesterday, for the next undetermined number of posts, I will be reviewing Laura Kalbag’s “Accessibility for Everyone“. I have discussed with Laura my intention to do this, and she has given me her approval. This is going to be a review of the book and my own personal take on the concepts and ideas. I do not in any way intend for this to be a replacement for the book or otherwise want people to consider that reading my long form review basically means it’s a Cliff Notes version of the book. I’m excited that books like this get written and I want to support Laura and other authors out there. If you think this book sounds intriguing, buy the book!!! One of the misleading aspects of Accessibility is getting a handle on exactly who is impacted and how many people that actually is. We look at disabilities and impairments as a single issue and try to address them when it is often the case that many people don’t just struggle with one accessibility issue but with several. Vision, hearing, mobility, and cognitive impairments can run a spectrum from mild to severe/total in people. If we look at the US, nearly 38 million people deal with a disability (12% of the population). 16% of people in the UK have a disability. I personally have been dealing with impaired vision over the past few years, which is normal for people of a certain age and older. With my readers, I’m basically a normal computer user. Without my glasses, I now struggle mightily to make sense of what I’m seeing. Language is important here. “Being disabled” speaks with a sense of finality, while “has a disability” means it is an issue a person deals with but it doesn’t define the totality of who they are. Laura emphasizes this latter terminology, and I think it’s a good approach. It helps eliminate the idea of disabled people being something other than or outside of ourselves. If we address Accessibility as something everyone will have to come to grips with at some point, it’s easier to consider and plan for development, because we’ve framed the discussion as we can all expect to “inhabit the disability” domain at some point. It helps to consider what disabilities we might be in for at some point. Laura makes an excellent breakdown of a variety of issues that people deal with in the disability sphere. Color blindness varies and shows up in men 16 times more frequently than it does in women (yes, women can deal with color blindness, too). Eyesight loss can be caused by many different things and can range from afflictions like glaucoma, cataracts, macular degeneration, astigmatism, etc. Auditory impairment can come in different flavors as well. There’s total hearing loss, which has a number of causes, and gradual hearing loss, which is more common. Motor impairments can range a number of causes, including cerebral palsy, multiple sclerosis, rheumatoid arthritis, muscular dystrophy, ALS, etc. Traumatic injuries to the brain and spine can also cause motor impairments, ranging from impaired movement to total paralysis. Cognitive impairments are also an issue, affecting things like memory, attention, problem-solving, text processing and math processing. Dyslexia also falls into this area and some dyslexic users use screen readers to assist them in reading information on pages. 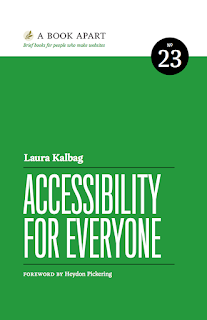 Laura also hits on a point that I often use when I talk about Accessibility, in that there are what we call “primary disability” and what I refer to as “situational disabilities” and what Laura refers to in the book as “environmental disabilities”. The point being, you may be a normative user most of the time, but a situation occurs that temporarily makes you a disabled user. Noisy environments, having to deal with a different language, low light levels, and other environmental issues can greatly impact the way that you interact with your applications. Statistics can be helpful, but they don’t tell the whole story. We do much better when we can humanize the situation, and get into the worldview of our users, whoever they may be and whatever issue(s) they may be dealing with. By understanding the possible range of issues, both primary and situational/environmental, we can get a better understanding of how and where we can address Accessibility issues.